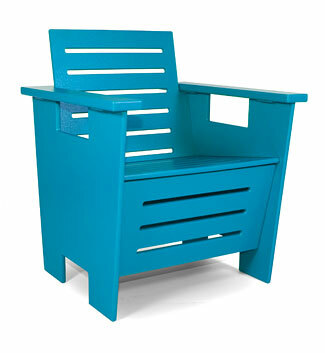 If you’re like me and your green thumb is the very lightest shade of the hue, you’ll love how easy it is to add a little color to your garden, thanks to some spectacular outdoor furniture offerings that Richard Schultz and John Kelly introduced at ICFF. 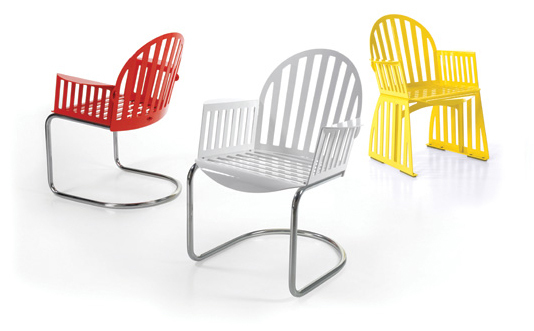 New from the iconic Schultz, the seating in the Fresh Air Collection re-imagines the classic Windsor chair in powder-coated sheet aluminum. Available in three highly polished classic colors, the chairs can be customized with either a tubular-steel base or an aluminum-panel base. Equally cool is the Fresh Air table, with thick square legs crafted of powder-coated extruded aluminum that complement beautifully both leg styles of the dining chairs. 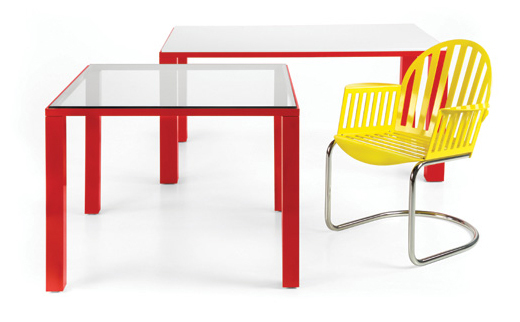 The table is available with a porcelain, glass or fiberglass top. I would love this in an office or studio in a screened porch. The Rho Series from John Kelly Furniture owes its sleek silhouette to a perfect combination of smooth curves and precise angles—and is available in 10 fabulous colors! A well-edited selection of chair and table styles allows for contemporary dining and conversation areas, not to mention a stylish way to relax by the pool. And if you can’t choose from all the great colors, consider the stripes! 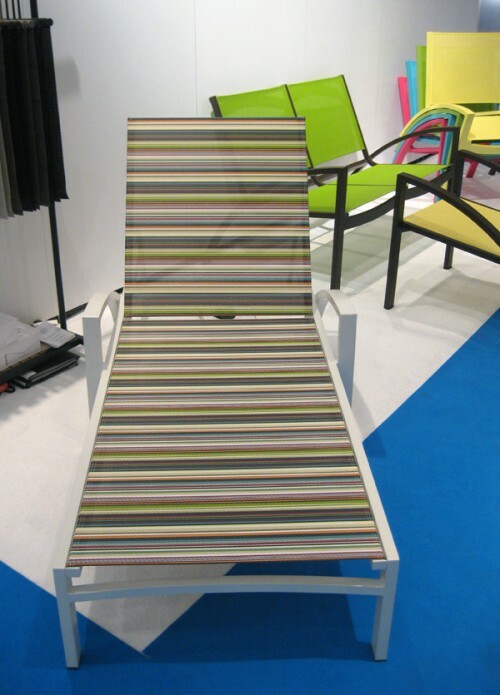 I loved this chaise lounge; the striped fabric makes for a great punctuation mark within the color palette. 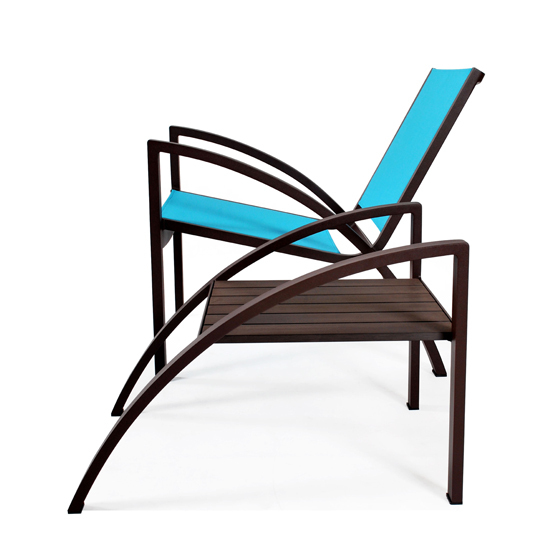 Just in time for Earth Day comes the Go collection of outdoor furniture, created exclusively for Design Within Reach by eco geniuses Greg Benson and Jeff Taly at Loll Designs. Crafted from 100-percent post-consumer plastic recycled from milk jugs, Go brings the indoors out with a modern spin on the classic club chair and loveseat, as well as accessories such as the side table and coffee table/bench. Built to last, every piece is waterproof, fade resistant and maintenance free. And with 90-percent of the waste from the manufacturing process being sent to a recycling plant, the Go collection’s carbon footprint is small in size and big on style. All seven pieces in the Go collection are available in seven colors, including black, white, British green, Chocolate, Apple, Leaf and Sky, shown here. The side chair offers plenty of space to relax, and boasts a more-upright back that most outdoor “lounge” chairs, a feature found throughout the collection. Choose from the stationary version above, or get moving with the rocking side chair. 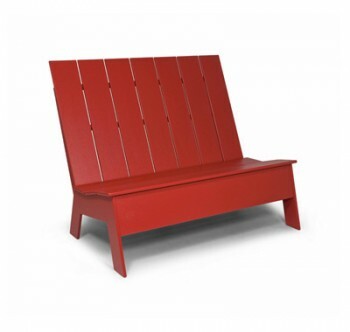 With winter on the way out, it’s time to entertain the thought of outdoor furniture. 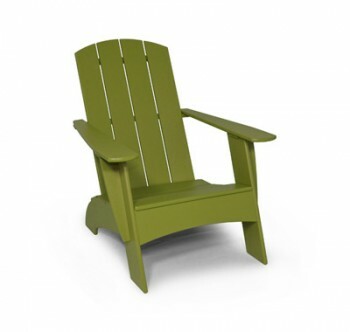 My dream is the Adirondack chair and bench ensemble and now I have found a product that fits the bill. 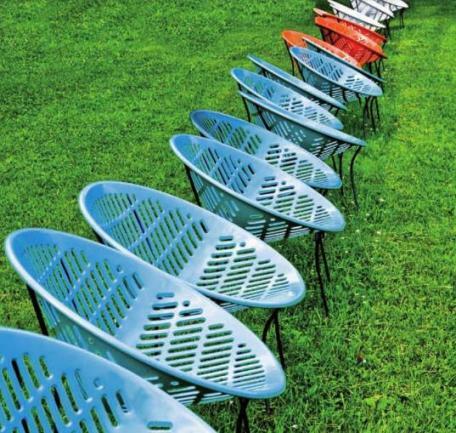 Recycled outdoor furniture by Loll Designs is absolutely fabulous and good looking too. A recent visit to a craft fair got me re-inspired about hammocks. A vendor there was selling “Hammock Chairs” and of course I tried the sample and fell in love all over again. Hammocks seem to have a super natural power that is most evident when you are swinging in them. 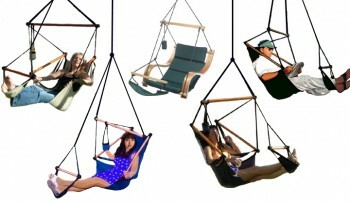 Hammock chairs are a way to integrate the hammock theme into half the space. Used as an ”indoor-outdoor” concept I think that this item is definately worth considering as a fun, alternative form of seating. I know my daughter would not protest if given the choice. Fall gardening is something new to me. I happened upon this popular pass-time by chance after my Mom gave me a book that she picked up at a yard sale. 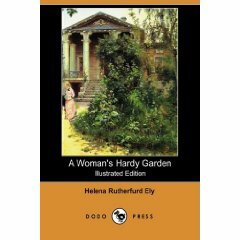 “A Woman’s Hardy Garden” by Helena Rutherfurd Ely first published in 1903 and re-published in 1990, has turned my world around. 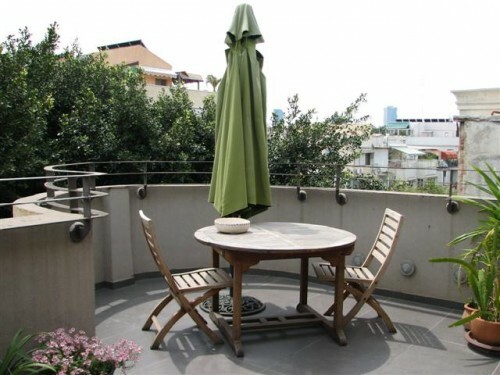 I mentioned on Monday that I took a lot of photos of Tel Aviv potter Ziva Hasson’s amazing apartment. As such I couldn’t stick them all in one post. Well, this is part 2 – the front and back balconies, guest bathroom, and office / guest room. The slate gray tile of the apartment is continued straight out onto the front patio. Notice the size of the tile is quite large. Having the tile continue outside gives a flow to the apartment and turns the front patio into an outside room. I don’t get garden-envy very often. 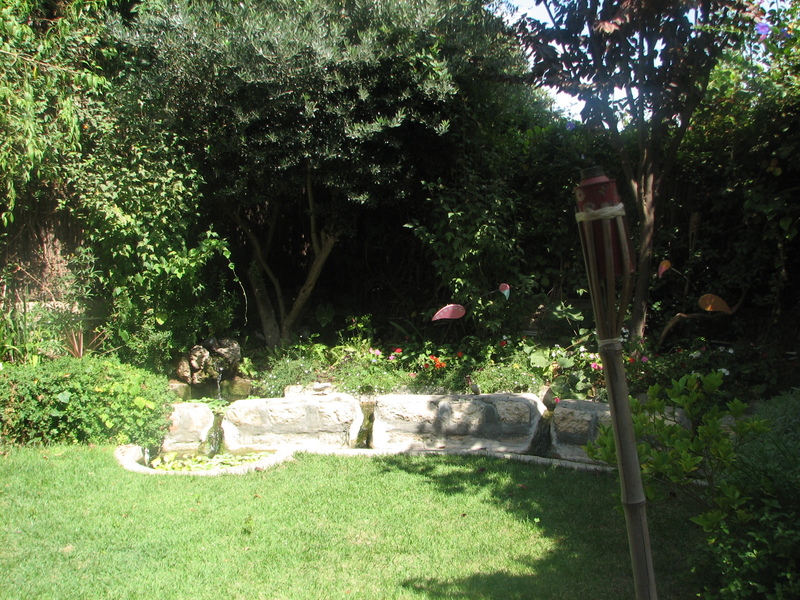 We have a nice size backyard and while it’s not the poshest place in the world, we did it ourselves and we love it. 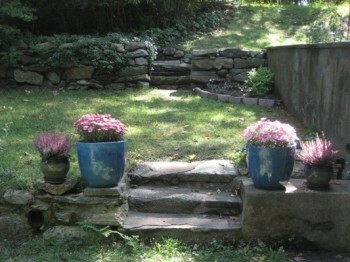 However, this garden has some elements that I would definitely like to encorporate into my backyard. 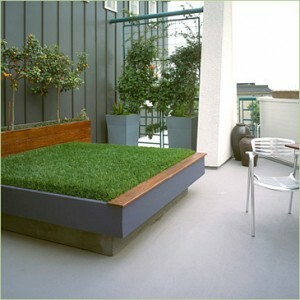 I wonder how they mow this bed? !